, a learned divine and antiquary, was born in 1740, at Norwich, of reputable parents. His father, who was of a Scotch family, had his son’s grammatical education completed at Amsterdam. 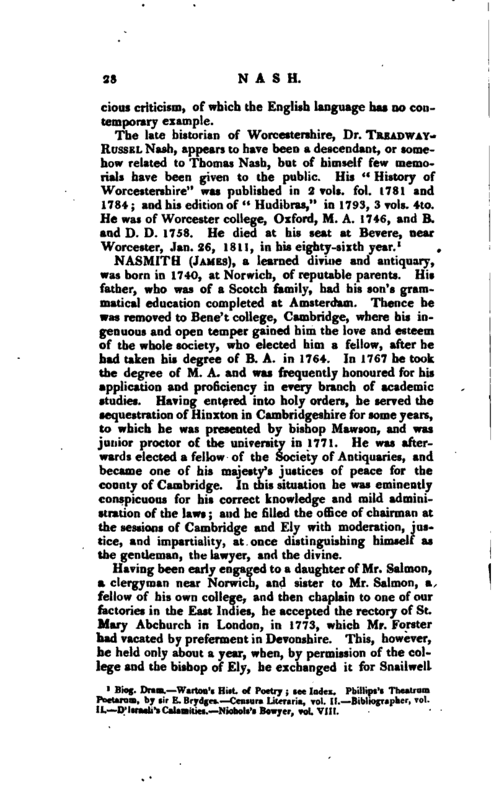 Thence he was removed to Bene’t college, Cambridge, where his ingenuous and open temper gained him the love and esteem of the whole society, who elected him a fellow, after he had taken his degree of B. A. in 1764. In 1767 he took the degree of M. A. and was frequently honoured for his application and proficiency in every branch of academic studies. 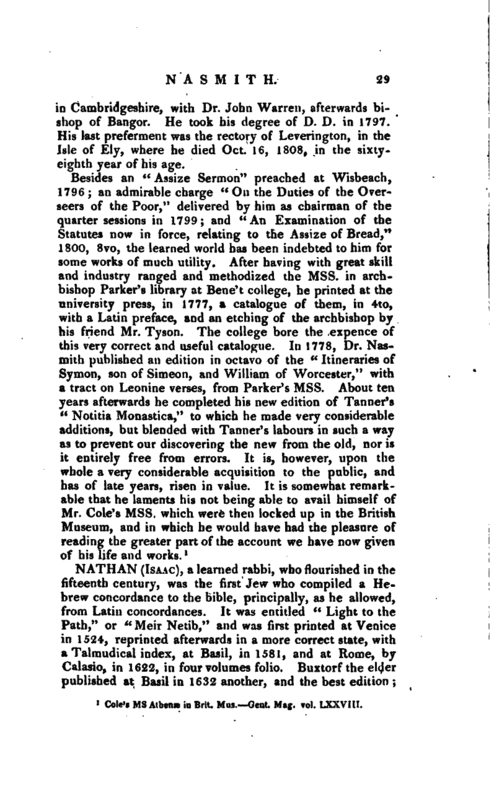 Having entered into holy orders, he served the sequestration of Hinxton in Cambridgeshire for some years, to which he was presented by bishop Mavvson, and was junior proctor of the university in 1771. He was afterwards elected a fellow of the Society of Antiquaries, and became one of his majesty’s justices of peace for the county of Cambridge. In this situation he was eminently conspicuous for his correct knowledge and mild administration of the laws; and he filled the office of chairman at the sessions of Cambridge and Ely with moderation, justice, and impartiality, at once distinguishing himself as the gentleman, the lawyer, and the divine. Having been early engaged to a daughter of Mr. Salmon, a clergyman near Norwich, and sister to Mr. Salmon, a fellow of his own college, and then chaplain to one of our factories in the East Indies, he accepted the rectory of St. Mary Abchurch in London, in 1773, which Mr. Forster had vacated by preferment in Devonshire. This, however, he held only about a year, when, by permission of the college and the bishop of Ely, he exchanged it for Snailwell | in Cambridgeshire, with Dr. John Warren, afterwards bishop of Bangor. He took his degree of D. D. in 1797. His last preferment was the rectory of Leveringtori, in the Isle of Ely, where he died Oct. 16, 1808, in the sixtyeighth year of his age. Dole’s ms Athenæ in Brit. Mus.—Gent. Mag. vol. LXXVIII.